LA Muscle Norateen Heavyweight II x 2 – Buy 2 for just £99, RRP £140.”THE best muscle builder” Men’s Health. Award Winning Testosterone Booster. As Seen on TV. Natural Muscle and Strength Builder, Increase Power and Definition Fast, Increase Muscle Size Fast, Immediate Increase in Strength. 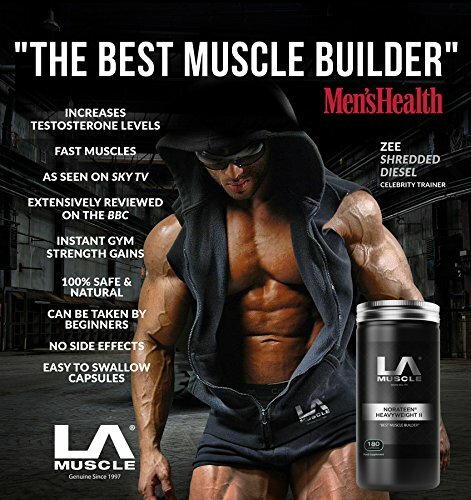 LA Muscle Norateen Heavyweight II x 2 – Buy 2 for just £99, RRP £140.”THE best muscle builder” Men’s Health. Award Winning Testosterone Booster. As Seen on TV. Natural Muscle and Strength Builder, Increase Power and Definition Fast, Increase Muscle Size Fast, Immediate Increase in Strength.. Voted as “the strongest ever muscle builder” by Men’s Health Magazine, as seen on SKY TV and even the BBC’s rugby sports panel wanted it banned for being too strong. Norateen Heavyweight II is the strongest legal and safe natural muscle & strength builder in the world suitable for beginners and advanced trainers. Results are guaranteed from the very first day when you will see your strength increase by at least 10-20%. As seen on TV. Norateen Heavyweight II is suitable for beginners and advanced trainers.